Fred VanVleet, along with backcourt mate Ron Baker, built quite a legacy during their four year career at Wichita State. VanVleet earned three MVC All-Conference 1st Team distinctions plus two conference player of the year awards, and leaves Wichita State as one of the winningest players in program history. A steady hand at the point guard position, VanVleet has shown he can be a coach on the floor by being the conductor of an efficient offense, while averaging a solid 16.8 points, 4.4 rebounds and 7.6 assists per 40 minutes. He never gets sped up with the ball and doesn't get fazed by ball pressure or double teams. He keeps the offense flowing and his 7.03 pure point rating is fourth best among all prospects in our top 100. He doesn't turn the ball over by trying to make highlight reel passes, but he takes care of the ball and has displayed great vision and feel for the game as a creator for his teammates. 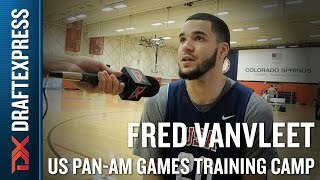 VanVleet was measured at 6'1 in shoes during the 2015 Pan Am Training Camp with a 6'2 wingspan, which puts him below average in terms of height and length compared with most NBA point guards. He isn't a great athlete either, as he doesn't possess a high top speed or a quick burst, but he has an exceptionally high basketball IQ, can operate at different speeds and utilizes his strength well to make an impact in the half-court. VanVleet will have to prove he can translate his effectiveness against the more physically gifted guards he'll encounter at the professional level, but his feel for the game, on-court presence and stable demeanor will help his chances tremendously. VanVleet is a pick and roll maestro, with 58% of his total possessions logged by Synergy Sports Technology derived from him running the pick and roll. He's an expert at using the ball-screen to create space to get inside the arc to make play, often by looking to get his teammates into space to shoot by delivering accurate, on point passes to the roll man, cutters or spot-up shooters. He turns the ball over on just 5.9% of pick and roll possessions and is never rattled no matter what level of pressure the defense throws at him. With the NBA being such a ball-screen heavy offense, VanVleet certainly has the chops to create some points from this play type while he is on the floor. The key to VanVleet's effectiveness running an offense, despite not possessing exceptional size or athleticism, are his terrific ball-handling skills, coupled with his propensity for changing gears and keeping defenders off-balance. He operates at a pace that is unique to him, handling the ball on a string and finds a great mix between scoring and playmaking. His best chance to score off ball screens is by pulling up for a jump shot, usually a three point attempt off the dribble. He shot 37.9% on 66 jump shots off the dribble logged by Synergy Sports Technology. He's also a fairly decent spot-up shooter, converting 38.1% of his attempts in his senior season with his attempts split fairly evenly between the two shot categories. The majority of these are three point attempts when he has the space to shoot with only 41 jump shots inside the arc as recorded by Synergy Sports Technology. When he penetrates into the paint, he prefers to pass out rather than shoot because he isn't a great finisher inside the arc with a paltry 39.6% two point field goal percentage. third lowest among prospects in our top 100. While this poor mark does not fully remove him from draft consideration, since 2000 only Josh Selby and Andrew Harrison have been drafted while converting less than 40% of their two point attempts in the same season. To VanVleet's credit, he did shoot 45% from 2-point range in his college career as a whole. With his below average tools, VanVleet struggles to get his shot off at the rim and can't always create space to attempt a floater before he reaches the restricted area. While he can get his defender on his hip to give him room to make a pass off the dribble, he rarely has enough separation for a shot attempt either close to the rim or as a pull-up two point jump shot. He will have to combine a three point jump shot off the dribble with his superb passing ability to be a multifaceted offensive threat. VanVleet was one of the best defensive point guards in college basketball, but there are some question marks about how his below average size and length will allow this part of his game to translate to the professional level. He's constantly talking to by calling out plays and directing his teammates to where the action is heading. He can also pick up the ball before halfcourt to tire out his opponent and burn the shot clock by putting some pressure on the ball. He generated 2.5 steals per 40 minutes pace adjusted with his quick hands on the ball and will definitely provide some energy and toughness defensively. Although VanVleet may not have prototypical size and athleticism for his position, he is a winning point guard who has plenty of intangibles a team could fall in love with, which could help easily help him earn a roster spot. He has a number of attributes NBA teams look for in backups, with his ability to make shots, find the open man, defend with toughness and keep mistakes to a minimum. Those are skills NBA teams value, and VanVleet could certainly play his way onto a NBA team when it's all said and done. Teaming with Ron Baker to form one of the top backcourts in the country last season, Fred VanVleet's NBA outlook remained largely unchanged from when we evaluated him almost exactly one year ago. Measured at 6'1 in shoes with a 195-pound frame and a 6'2 wingspan this summer, VanVleet lacks great size or length for a point guard and isn't a freak athlete, but compensates with a unique blend of toughness, savvy, and skill that has made him one of the very best players at his position at the college level over the last two years. Opting for one more go round as a Shocker in lieu of heading to the professional ranks last spring, VanVleet will once again look to lead Greg Marshall's program deep into March. The 2014-2015 season was a transitional year for Wichita State as they looked to build on their sudden rise to national prominence without the versatile, efficient scoring of Cleanthony Early. Seeing his usage expand from 10.7 possessions per game as a sophomore to 14.1 possessions per game as a junior, much of Anthony's burden fell to VanVleet. Posting gaudy efficiency numbers as both a scorer and facilitator as a sophomore, the additional scoring load the Rockford native carried as a junior took a toll on his efficiency, even if he continued to play at a high level. Connecting on 42% of his jump shots and 58% of his attempts finishing around the rim in the half court as a sophomore, VanVleet looked to be more aggressive creating for himself off the dribble as a sophomore. He shot a merely average 50% at the rim this season taking it upon himself to make plays for the Shockers in key moments, only magnifying the limitations his size and athleticism can be when he ventures inside. Shooting nearly twice as many pull-up jump shots than he did a year ago and connecting on only 32%, VanVleet made a less impressive 36% of his jump shots as a junior. He remained a very reliable shooter with his feet set, but his assertiveness took an obvious toll on the quality of shots he attempted throughout the year relative to two years ago. Making a name for himself as a facilitator who could score with terrific efficiency in a complementary role, VanVleet, to his credit, did not shy away from his new role in the slightest, upping his scoring average from 15 points per 40 minutes pace adjusted as a sophomore to 18 as a junior. Even though his efficiency numbers fell, he still ranked well above the national average thanks to his strong overall skill level. It will be interesting to see if VanVleet's shooting numbers bounce back as he adjusts to being a more prominent scoring threat. One area where VanVleet did not take any discernable step back was as a passer. Averaging 6.9 assists per-40 minutes pace adjusted as both a sophomore and a junior, VanVleet's outstanding vision and feel at the point guard position remain has most appealing asset as a prospect. He was nothing short of tremendous making reads out of the pick and roll in the NCAA Tournament, propelling the Shockers past Indiana and Kansas on opening weekend. Finishing third among prospects in our top-100 in pure point rating, VanVleet's turnover percentage actually fell by a fraction of a percent despite how much more he was asked to do offensively, a testament to the impressive decision-making he brings to the table at the point guard position. Pulling down 6 rebounds per-40 minutes pace adjusted, an extremely impressive mark for a point guard measured 5'11 without shoes, VanVleet is a gritty player whose fundamentals and competitiveness make allow him to contribute in a variety of ways at the college level. Translating to the defensive end where he ranked third in our top-100 in steals per 40 minutes pace adjusted, few point guards in the college game has as big of an impact on both ends of the floor as VanVleet did for the Shockers. Despite all that he brings to the table, VanVleet will continue to face scrutiny for the things that he can't change. Come next spring, scouts will still have the same concerns about his lack of size, length, and prototypical athleticism that they did last spring, but they'll also still rave about his demeanor, the uncommon maturity of his skill set, and his ability to run a team. A strong threat to be tabbed as an All-American as well as hear his name called on draft night, VanVleet is a player worth watching as he looks to put the finishing touches on his illustrious college career. Averaging 11.6 points, 3.8 rebounds, and 5.3 assists per-game as a sophomore at Wichita State last season, Fred VanVleet's played a key role in the Shocker's 35-0 start as the steady hand steering one of the nation's elite offensive units. Invited to the Nike Point Guard Skills Academy and CP3 Elite Guard Camp this summer, the 3rd team All-American was nothing short of tremendous last season, emerging from relative obscurity after backing up Malcolm Armstead as a freshman to solidify himself as one of the top point guards in college basketball, planting himself firmly on the radar of NBA scouts in the process. At 6'0 with a 6'1.5 wingspan, VanVleet's lacks great size, length, and explosiveness for a point guard, but he is a strong, fluid athlete with good ball-handling ability who can keep defenders off balance with his crossover and knack for changing speeds off the bounce. Despite being ranked late as a Top-100 player the high school class of 2012 by Dave Telep at ESPN (but not by anyone else), VanVleet was largely under-recruited out of Auburn HS (IL) for most of his high school career. He isn't the type of player who stands out on first glance, and will face questions about his size and athleticism when he looks to make the jump to the NBA, but it became impossible to ignore the pre-season All-American's ability to play brutally efficient, low-mistake basketball at the point guard position last season. Averaging 16.2 minutes per-game as a freshman, The Rockford native stepped into a feature role from the start of his sophomore year as the primary ball-handler, and thrived when asked to be the main facilitator for the deep, versatile, and talented group Wichita State put on the floor in 2014. Ranking second in assist per-40 minutes pace adjusted and first in pure point rating among top-100 prospects, VanVleet is one of the top distributors in college basketball. Posting a 6.6 assist-to-turnover ratio in transition, VanVleet combines excellent ball-handling ability with terrific pace, patience and vision. Seemingly never forcing the issue and possessing an excellent command of Gregg Marshall's offense, the 20 year old plays with a unique maturity and poise considering this was just his first season playing significant minutes at the college level. More than just a passer, VanVleet also emerged as an efficient scorer last season as well. That efficiency starts with his terrific perimeter jumper. Shooting the ball with a smooth, compact release that looks effortless at times, VanVleet knocked down a tremendous 44% of his catch and shoot jump shots and 46% of his pull up jumpers a year. Though he only attempted 90 three-pointers in 35 games, VanVleet appears to have the ability to keep defenders honest out on the perimeter and also make them pay when he finds space in the midrange. Though the junior ranks 1st among point guards in our top-100 in points per-play, he isn't without his flaws as a scorer. He does a nice job probing the defense with his dribble and absorbs contact well thanks to his near 200-pound frame, but his 57% shooting around the rim is only above average, as he struggles to finish among the trees when they take away his angle to the glass. Possessing just average explosiveness, VanVleet is not the type of point guard who will come down the lane and put anyone on a poster, and while he isn't a bad finisher by any means, he'll face a challenge when he makes the jump to the next level where the length and leaping ability of the big men he'll find will dwarf what he saw on a nightly basis in the MVC last year. Averaging only 15 points per-40 minutes pace adjusted a year ago, VanVleet's lack of prolificacy as a scorer could be looked at as a weakness relative to his peer group, but it is more a reflection of his unselfishness and the tremendous balance Wichita State found offensively a year ago. With the team's leading scorer, Cleanthony Early, making the jump to the NBA, it will be interesting to see just how much of the scoring load VanVleet shoulders this season and what if any toll it takes on his efficiency. One of the most unique attributes of VanVleet's game is his rebounding ability for a player his height. Pulling down 4.9 boards per-40 minutes paces adjusted, VanVleet is not a game-changing rebounder, which isn't a slight considering the minor contributions most players his size tend to make in that area, but he isn't afraid to mix it up inside, will try to box out big men from time to time, and will compete for the ball in traffic. VanVleet has terrific defensive fundamentals on the whole, doing a nice job closing out shooters, keeping his feet active, and playing with consistent intensity. Though the small guard isn't a freak athlete, he does possess impressive quickness and can be a pest when opposing guards are loose with their handle away from the rim. His height limits his ability to contest shots, especially in the paint, but he won't give up on plays when his man gets a step on him and is aggressive with his hands going after the ball before his man can get into his shooting motion around the rim. One of the most interesting stories among prospects in the junior class given his year-long rise to national prominence, Fred VanVleet has established himself as a viable draft prospect. The track record for guards his size at the NBA level is not great, but VanVleet's exceptional maturity and efficiency as both a scorer and a passer certainly puts him on strong footing in the eyes of scouts. He'll be a player to watch closely this season as he'll have the opportunity to grow his reputation on the heels of the national attention Wichita State will receive after what they accomplished last year, as he aims to help fill Cleanthony Early's shoes and fuel the Shockers to another successful season.